Get Ready to Go Fur-Throttle with Crash Team Racing Nitro-Fueled | Activision Blizzard, Inc.
SANTA MONICA, Calif.--(BUSINESS WIRE)--Dec. 6, 2018-- Crash is back again, and this time he’s revved up to the max in Crash™ Team Racing Nitro-Fueled, an authentic Crash Team Racing experience that’s been remastered in stunning HD and so much more. Power-sliding into players’ hands on June 21, 2019, Crash Team Racing Nitro-Fueled also brings fans online multiplayer racing. Get ready to start your engines as the game will be available for the PlayStation® 4, PlayStation® 4 Pro, Nintendo Switch™, and the family of Xbox One devices from Microsoft, including the Xbox One X. Crash Team Racing Nitro-Fueled and the Crash Team Racing Nitro-Fueled - Nitros Oxide Editionare available for pre-order starting today. Crash Team Racing Nitro-Fueled will be available for the suggested retail price of $39.99.Crash Team Racing Nitro-Fueled - Nitros Oxide Editionwill be available for the suggested retail price of $59.99. Watch the official trailer here. More information about Crash Team Racing Nitro-Fueled can be found at www.crashbandicoot.com. Fans are also invited to follow Twitter, Facebook, and Instagram, as well as subscribe to the YouTube channel at YouTube.com/crashbandicoot. 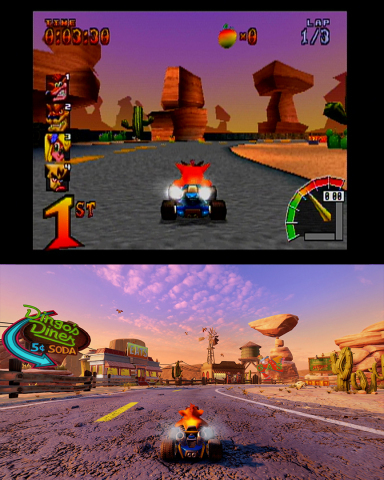 Cautionary Note Regarding Forward-looking Statements: Information in this press release that involves Activision Publishing's expectations, plans, intentions or strategies regarding the future, including statements with respect to the expected release dates, features and functionality of Crash Team Racing Nitro-Fueled and Crash Team Racing Nitro-Fueled – Nitros Oxide Edition, are forward-looking statements that are not facts and involve a number of risks and uncertainties. Factors that could cause Activision Publishing's actual future results to differ materially from those expressed in the forward-looking statements set forth in this release include unanticipated product delays and other factors identified in the risk factors sections of Activision Blizzard's most recent annual report on Form 10-K and any subsequent quarterly reports on Form 10-Q. The forward-looking statements in this release are based upon information available to Activision Publishing and Activision Blizzard as of the date of this release, and neither Activision Publishing nor Activision Blizzard assumes any obligation to update any such forward-looking statements. Forward-looking statements believed to be true when made may ultimately prove to be incorrect. These statements are not guarantees of the future performance of Activision Publishing or Activision Blizzard and are subject to risks, uncertainties and other factors, some of which are beyond its control and may cause actual results to differ materially from current expectations. © 2018 Activision Publishing, Inc. ACTIVISION, CRASH, CRASH BANDICOOT and CRASH TEAM RACING are trademarks of Activision Publishing, Inc.